possibly the finest oversuit in the world. . .
Commuting into London by bike can be a pain. For lots of reasons. Now while nobody in their right mind would deliberately travel into the metropolis by car, many of the advantages gained by the intrepid motorcyclist are negated by the length of time it takes to get into, and out of, normal bike gear. And with urban traffic increasing at roughly the same rate as driving standards fall, it would be a reckless commuter indeed who would make the journey in regular clothes. But help is at hand. Though the USA has produced some exports that we could really do without - I'll leave the specifics to your imagination - one of the more welcome products to cross the Atlantic is the Roadcrafter suit from Aerostich. No, it's not a typo - I always thought it was Aerostitch too. But it isn't. Live and learn, eh? The Roadcrafter is a one piece oversuit. With a difference. One leg has a zip running from the ankle to the crutch. The other side of the suit has a zip running from the ankle to the neck. It takes, literally, 10 seconds to put on and take off. And you wear it over your regular clothes. The suit is made of a GoreTex, Cordura and Nylon mix that is waterproof, ridiculously tough and surprisingly light. It's available in a wide range of colours - happily the chap that specified it had similar tastes to me. And a similar physique, but I'll come to that in a minute - and it's comfortable as anything to wear. It ought to be a good fit because you can only get one of these suits made to measure, direct from the manufacturer. That's why it's lucky that I'm a similar size and build to the previous incumbent. It really is a good job that we have similar tastes in colour, and that we draw the line between conspicuity and coolness in a similar place. Because Aerostich jokingly suggest that you can "Be seen by the blind. In the dark." Some of their colour schemes might make a natty catchphrase into an almost valid advertising claim. Fluorescent yellow with, say, orange ballistic patches, anyone? Actually I need to clarify a few things. 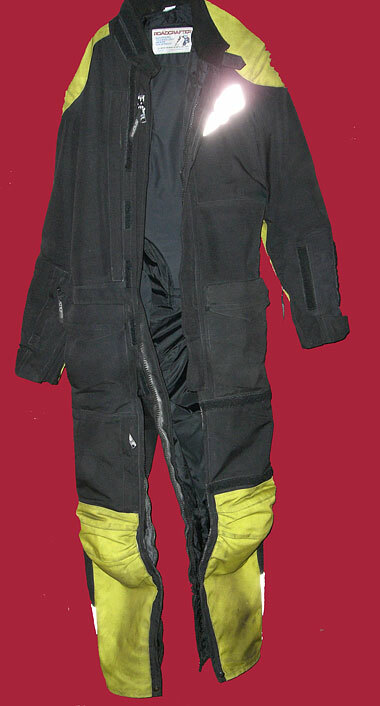 The suit itself is made of Cordura, with extra layers in vulnerable places like under the backside. The there are what they call ballistic patches, made of heavyweight urethane coated nylon, on the shoulders, elbows and knees/shins. When you spec your suit you can choose from a wide range of colours for the ballistics to go with the blue, black, red, grey or hi-viz (fluorescent) yellow main suit. Blessedly, my suit is black with hi-viz ballistics. 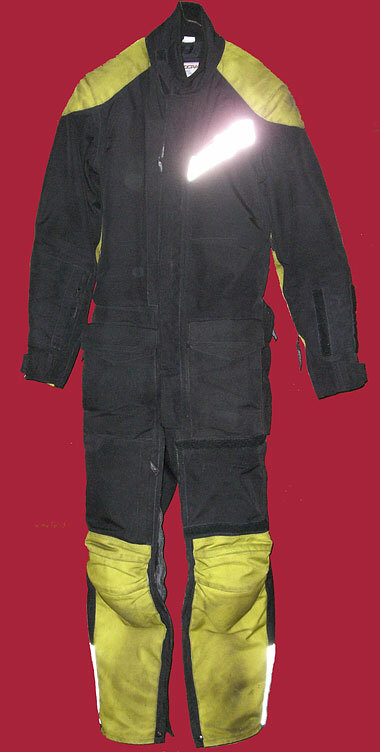 Inside, the suit is lined and there is armour in the shoulders, knees and elbows, padding over the hips and a built-in back protector. Being American, Aerostich are big on choice. So you can elect to have as little armour fitted as you wish, or can choose to beef things up a bit with hard shelled armour. You don't need to, though. The soft armour used as standard is one of those irritatingly clever "developed for aerospace" materials that does exactly what you want. It's soft and comfy until you clout it, when it goes hard and just absorbs impact. Regardless of what's fitted, anyway. everything is home removable as you choose, whether for cleaning, comfort or sheer bloody mindedness. I've been using this suit for the last five months or so, day in, day out, and the previous user had it for two years. It's been used a lot. And I still can't really fault it. It isn't perfect. It doesn't look as good as my leathers, and it gives me a terrible air of respectability that, try as I might, I can't quite shake off. More importantly, it does leak occasionally. I've got properly wet once, in an absolute torrential downpour, and slightly damp once, in rather worse weather. The difference between the two experiences was down to the excellent customer service I got when I e-mailed Aerostich and grumbled. Because of the design of the suit, there are vulnerabilities around the knees, where the zips get rucked up, and around the crutch. A quick trip to a camping shop for some zip sealer and I was all ready to stay dry. Successfully, too, as since then I have genuinely just got mildly damp once, in the most appalling conditions I've ridden in for years. Though the getting wet is a bit of a downer, in context it's a pretty minor thing. Because the rest of the suit is fantastic. My predecessor went down the road in it and it's unmarked. More to the point, so was he. Because it's so easy to use, and so comfortable, putting the suit on stops being a chore so the temptation to ride in unsuitable clothing is less. In the summer it's pleasantly cool, being chock full of (closeable) vents, while in the winter it's spacious enough to wear layers and stay toasty warm. Obviously it is windproof, and the high collar and effective cuffs serve to keep it so. Road grime does build up, of course, but the suit is machine washable at home, and can be reproofed when necessary using readily available camping stuff. One thing I like a lot is the number of pockets. Proper, secure, waterproof pockets. Mine even has a clear map pocket as well as a mobile phone pouch, both external to the suit and secured by velcro. The phone pouch can stay at home, but if you're a courier it could be handy. Oh, and something else, too. A big zippered pocket that actually doesn't have a lining and allows you to get to your trouser pockets underneath. Very useful. Now it probably won't shock you to learn that a made to measure, completely bespoke motorcycle suit isn't cheap. But with the current exchange rate, the list price of $727 is under £400, Which is staggeringly good value. I can't recommend the Aerostich Roadcrafter highly enough. Take the plunge and you'll truly wonder how you'll ever go back to normal bike gear again.